Hi, I've had my GM36 for about a month now and thought I'd share my solution to racking the unit. My aim in getting the Grandmeister was to reduce the size and weight of my gigging rig. I used to lug a Randall MTS modular rack system around with a combined weight of over 50kg. I initially thought the built in effects would be enough as I only use a bit of delay and phase/chorus but I was a bit disappointed in the quality of these. I therefore decided to press my Digitech GSP 1101 into service and rack the whole thing. The GM36 gets pretty hot so I wanted to ensure there was some cooling. I ended up constructing the rack myself out of ply and some rack strips. This gave me the opportunity to size it exactly to my needs and incorporate two 4" fans from an old PC workstation. There is a handy power distribution strip at the rear. This has worked incredibly well for me and the Digitech integrates with the amp seamlessly. I control everything from a Midi Grande pedal and have added a Morley mini expression pedal for wah and volume duties. 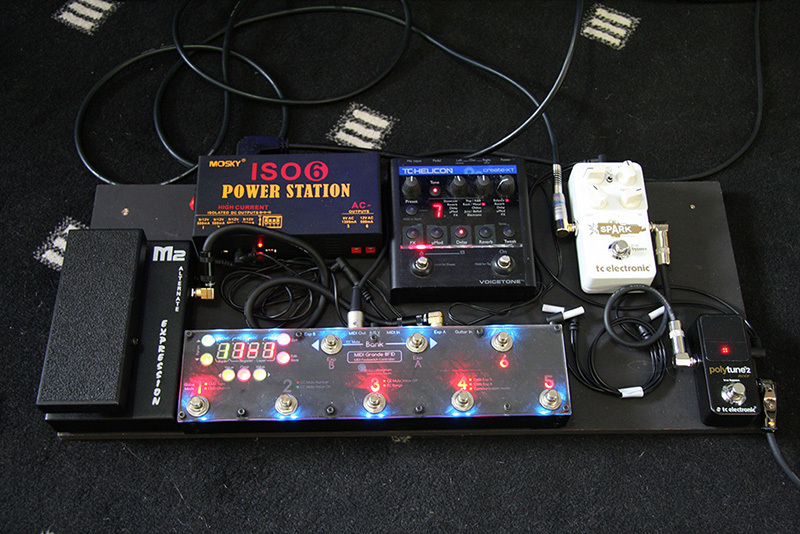 The whole pedal board is only 600 x 250mm. Really pleased with the Grandmeister and have played a few gigs with it so far. I have no problems getting heard and we havce a very loud rhythm section! Nice! I love seeing pics of folks' setups! I have a 6U rack as well. Can I ask how your GM is secured in the box? And what is your signal route - is the GSP in the amp's loop, or is it 4CM? Love it. Thanks for posting! Thanks gravydb. The GM36 sits on top of the GSP1101 and the very top of the back rests against the power strip (which is metal). The two fans at either side stop it moving left to right. I was going to secure it at the front with a couple of rack ears but I've found it's not necessary. It also means I can easily remove it for standalone use. I had to play with the levels a bit on the Digitech but I find it plays with most amps very well, much better in fact than the G-System I used to use. JonnyB, How ironic to see someone using a Digitech GSP1101 with an H&K GM36! I had that Digitech and using it as a preamp with a Marshall 8008 Valvestate, I sold that whole rack kit to buy the GM 36. 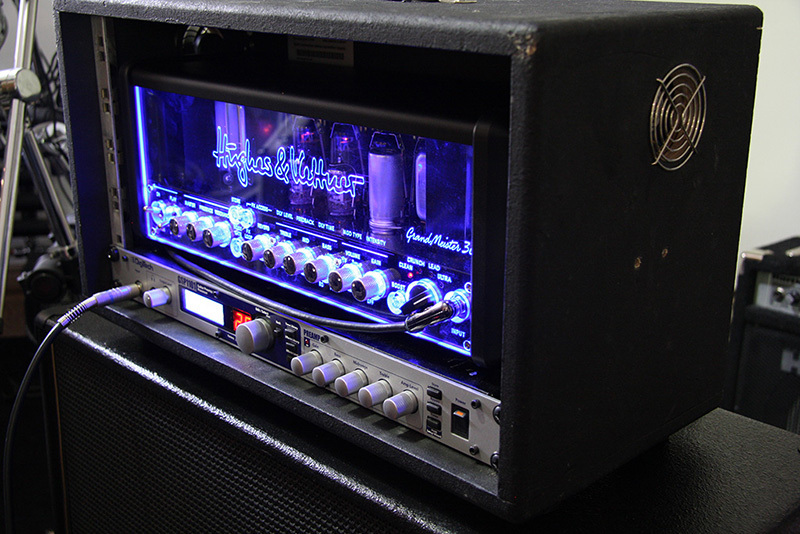 I miss that rack system, I had it for a very long time and was hard to see it go, but I was certain that after finding the right tube amp I would probably end up storing it away and never use it again. Do miss it though, I have been pondering adding some more tones and was thinking of putting to use a rack unit or pedalboard system thru FX loop but am concerned there may be some hissing or noise. I'm guessing you are using it in FX loop, how does it sound with the GM 36? P.S. - Nice job on turning the amp into a rack setup, I am a product the 80's hair metal days and love rack systems, was thinking of do this too. JonnyB - I too had a G-System, it was my prior rig, with a TM18 head. 4CM, the amp being in the G's fx loop. Fantastic kit but after a couple years I realized I was constantly chasing my tail, tweaking, tweaking, tweaking... the G-System has seemingly infinite parameters not only on the fx but all the input/output levels... I love to tweak but man I was driving myself crazy! The Grandmeister helped bigtime, it is WAYYYY simpler! G-System main Out -> TM18 fx loop return. The G-System has 2 fx groups, the first of which contains fx that typically should be located before the amp's poweramp section, the second of which contains fx that typically should be located after the amp's poweramp section (delays, reverbs, etc). The G-System's fx loop sits between those 2 groups, thus allowing the 4CM to properly route the signal. It's a thing of beauty, but like I said, I was spending too much time down the rabbit hole... Every once in a while I do miss those TC quality fx, but honestly (IMO) the Grandmeister's fx are perfectly fine for most situations. Gravydb, you are so right that I want to get the GM36 into a rack setup, probably nostalgic sentiment on my part as I always loved the rack systems since those hair days of the 80's. I will buckle down one day and Macgyver up something. Let me ask you guys about this scenario, I have 2 multi-fx pedals the Zoom G1on and Korg Pandora, I mainly use them with my Marshall headphones to practice silently in the evenings. Yet they both have great tones and lots of versatility to them similar to the GSP1101. Can they be used in an fx loop hookup? I tried once and there seems to be a lot of hissing and over saturated tones from the presets, I am using the newest of guitar and pedal patch cables but either I don't have it setup right or settings not adjusted properly, if I go to low on the unit's volume then its almost no point in using them and if I go to high then the thing just produces over saturation or the signal. I am not much of a pedal stomper and when I connect them as traditional foot fx pedals between the guitar straight into amp out comes all that noise typical of fx pedals and need to get the noise gate threshold way up there which now is cutting out part of the signal. Or is it that these 2 units are simply not really fx loop usable. Having always been a solid state amp guy with fx loop racks connected or fx built into the amp itself such as the Blackstar ID60TVP or Fender Mustang III v2 amps I'm not up on how to use multi-fx devices with a tube amp. I must confess that back then in the 80's I went thru every brand foot pedal from compressors, overdrive or distortion to delays, flanger, chorus, etc all in a row into the amp but I really cannot say I liked it at all. When fx loop and rack systems became a standard I was ecstatic to say the least. Granted this tube amp had built in fx and they are tasteful enough, but to have access to that much more on these units would get me much more range of sounds. Am I missing something? Hmmmm.... well for starters (and please don't take offense if you already know this)... and this is just my own opinion as well... but I would make sure you aren't pushing an amp model into the Grandmeister. Because then you're stacking amps and god knows what offspring that will produce If I was going to add outboard fx to the GM, it would only be pure actual fx, no amp modeling, no spkr modeling, and little if any added overdrive. But hey that's just me, I'm weird. Not that there's a rulebook that says you're not allowed to do those things, but personally I'd avoid it. Just my opinion. But anyway yeah if you're just adding outboard delay/chorus/reverb/etc then the amp's fx loop would be the best spot for it, as it sits after the pre-amp section and before the poweramp section. Gravydb, no offense taken, but I must submit to you that I may be a dumba_s after all, now that you've mentioned amp modeling, it totally slipped my mind that the pedal device's preset programs do in fact include amp modeling within the string of fx on most of them and yes I was doing just that. Actually I would guess its that which gives their presets distinctive sounds, at least through the headphones for sure. I am going to try some of them in fx loop with their amp model setting switched off in the presets and going with just the fx strings active. I guess that may also be why plugged in straight I got all the over saturation, huh? Thank you, I think you hit it right on the nail's head! But that means these units in order to work with their presets amp modeling enabled on any amp tube or ss, you would have to configure the amp's equalization to the most static clean you can get from it and essentially using it as a power head, or that these devices are probably best used in a situation where just a power head amp is used? 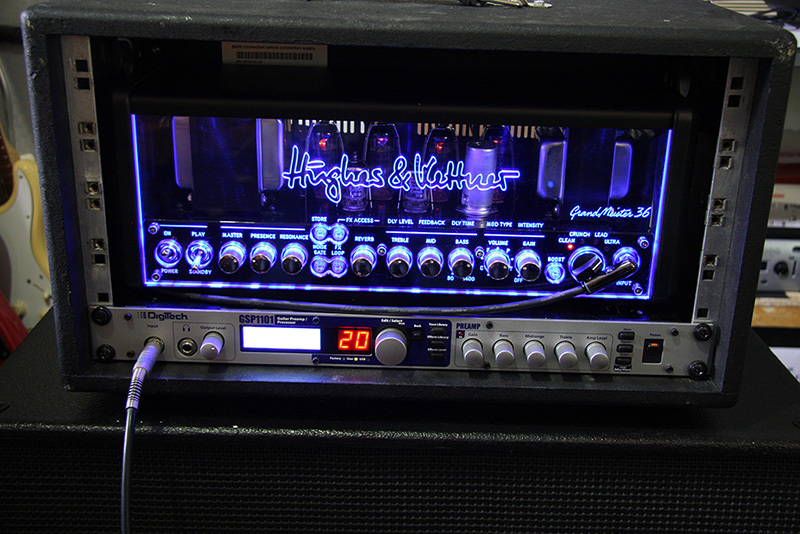 Sort of like that Marshall 8008 Valvestate rack I was using with the GSP1101 as its preamp. See what happens when you get so accustomed to a particular thing for so long that you become complacent and miss some of the simplest obvious items! 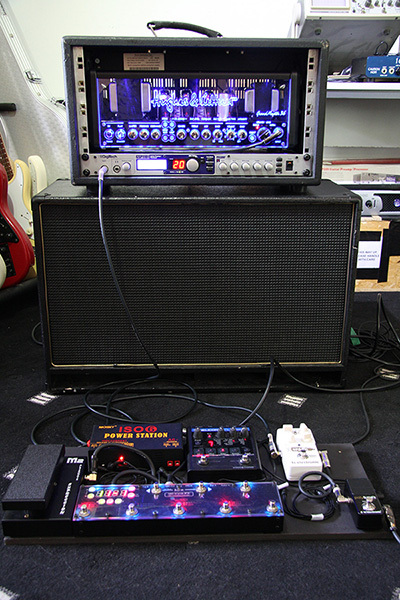 My secondary 'rig' is a Boss GT multi-fx board, with of course full modeling, I use it for situations when I need an extremely small footprint and/or I need to setup & teardown extremely quickly and/or for simplicity's sake I need/want to just go direct to the PA system. It works beautifully and sometimes I wonder why I bother with a traditional amp & cab setup HA. But anyway I never ever put the GT thru a guitar amp, I only go direct straight to the PA system or recording interface or whatever the situation is. All that modeling is designed to be sent to a full range sound system (PA system, headphones, recording interface). Yes, you have to be careful to turn the amp modelling off whatever multi-effects you are using. In my case I'm using wah, compressor and very occasionally one of the stomp box distortions before the GM36 input. I love the wah implementation in the GSP1101 and it seems to work very well with all the GM36 channels. Of course you could get creative and set up some patches without fx loop on the Digitech, then you could use the amp modelling straight into the GM36 power section. I've tried this and it does work reasonably well, however I always find the modelling sound lacks dynamics and punch when used in a live situation. I have a Kemper rack and tried using that live for a while but in the end something was missing... Somehow I always go back to the little glowing bottles of goodness! By the way, the GSP1101 has an excellent speaker modelling section which allows you to load in your own impulse responses. I actually prefer the sound of this through the PA than the in built red box DI on the Grandmeister. 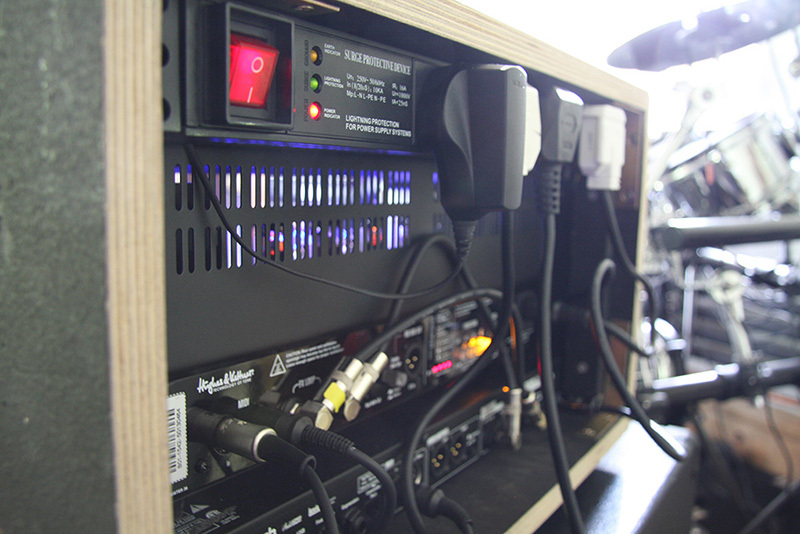 Another advantage of this solution is that the level remains constant if you need to adjust the stage volume of the amp so easing the job of the sound engineer. Little things that make all the difference in a live situation. JonnyB, like I mentioned I miss that GSP1101, I recall the amp models in there with their respective speaker cabs. And all the FX with so many equalization settings possible, it's truly an excellent preamp multi-fx. And if you search for them on ebay or reverb you'll see they still hold their value. My cousin had a Rockton Prophesy preamp, which so many player made such a fuss over, costs more than the Digitech and I still feel that the GSP1101 wrecked the hell out of it with tones and features. It is versatile, I guess I was attempting to get some of that back with the Zoom and Korg. I do like be a guitarist that takes literally less that 10 min from unloading the car to being all hooked up and ready to jam. Not a true foot stomper guy, I like a crunchy tone with a mild delay and chorus to fatten it up a bit and either I back off the volume to get a cleaner tone or I use that Tech 21 MIDI Mouse to switch between presets I have saved on the amp. My only pedal really is the Zakk Wylde Dunlop Wah. I like a simple setup, I always felt the less stuff you need to worry about while playing such as switching channels or stomping on an array of pedals then you are not focusing on the one thing you're supposed to. the guitar! But that's just me. Right now I'm back to going without an fx loop setup and working on the amp's fx to build some more cool patches to save. JonnyB I think your rack would look so much more cool if at the top you added a rack power and light module, like mine the Alesis Powertrip 8, my only thing left from the rack setup I had. Furman and others make similar, you could illuminate it from the front while it sits on the speaker cabinet. And if you end up with 1U space you can add a black perforated spacer between that and the amp, and with a blue led light strip placed behind would give it added WOW effect! Stuff I have been thinking up while pondering how I might do a rack setup to. That's a neat idea stargazer, I might just do that! I am curious about your midi connections as I am trying to do something very similar with a Kemper Profiler. But I am confused if the GM36 should control the processor via MIDI or if the processor should control the GM36 via MIDI. I need to be able to use CC's for wah, volume, etc. I would be grateful for help you can provide!